I went round to my friend’s house for a yummy Saturday lunch. Now Sarah has already featured on this blog because of her fantastic cooking which is Cuban inspired, http://wp.me/p1sdbX-4k. So we made homemade burgers and exchanged chips for some fried plantains. Plantains are fried all around the world, wherever they are grown but they are also getting more and more popular in the UK as they are just delicious and easy to find! You can fry in a pan or in a frying machine. Peal the plantains and slice them, about 4cms high. 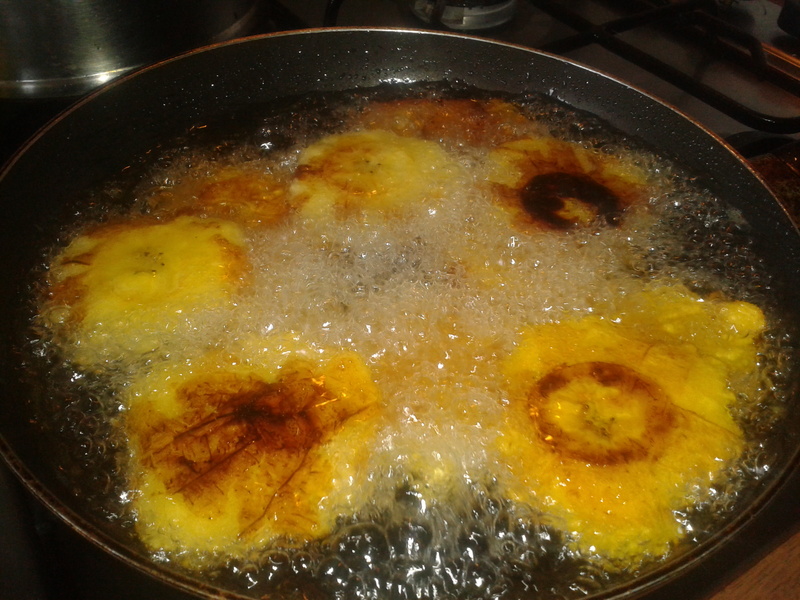 Add oil into a frying pan, you want there to be enough oil to cover at least half the height of a plantain slice. Boil the oil and add the plantain and wait until it starts to golden, then turn and do the same on that side. Remove the slices onto a plate and then one by one place them in the cooking paper, fold and press down to squash. Return the pieces to the oil until they have a crispy looking exterior. Remove from the oil and place on some kitchen paper and spinkle with salt. Serve straight away whilst nice and hot.